At the nose tackle position, Nebraska has a Blackshirt-wielding junior in Mick Stoltenberg. After that, there are two true freshmen. 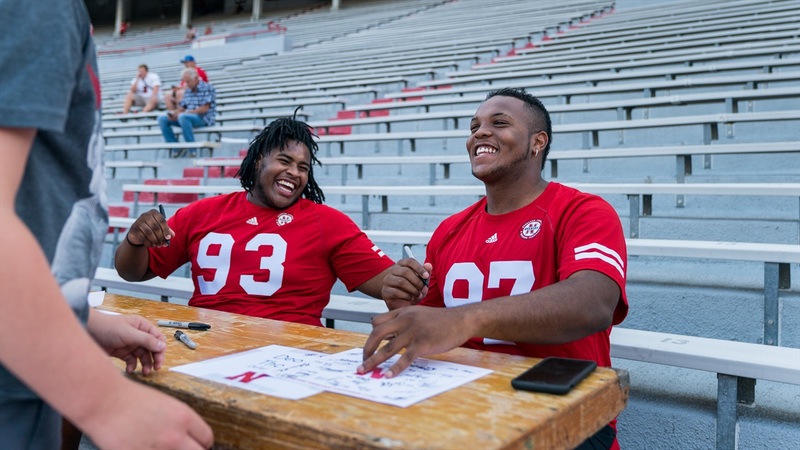 Before fall camp even started, Deontre Thomas looked out at the crowd that turned out for Nebraska’s Fan Day and was wowed by what he saw. “It just makes me happy and makes me want to play and make them happy and win,” he said of the support from the fans. Now, with the season opener against Arkansas State just a few days away, Thomas, and his buddy Damion Daniels, won’t just be playing, they’ll be seeing significant time. “Those two are special,” linebacker Chris Weber said. And he’s not just talking about the frames – Thomas comes in at 6-foot-3, 280 pounds, while Daniels is listed at 6-foot-2, 310 pounds – but the attitudes. For both guys, the opportunity came two weeks ago when Stoltenberg was sidelined with an injury. Where Stoltenberg is brute force, Thomas is quickness and mobility, then it’s back to pure strength with Daniels. Fire and ice, and fire again. They’re monsters. I’m talking about these kids are gonna be real good. Coach Parrella did a great job in recruiting them. He had great taste when he recruited these athletes. Athlete feels like a good way to describe the pair. They’re both big, but they know how to use their size. Stoltenberg said there was no messing around once camp started, they were ready to go from the jump. There isn’t even one play that stands out either. No specific moment or blown-up play where the older guys have sat back in shock of what the two new guys are doing, and yet, they’ve still had “my goodness, these kids are freshmen” moments. It’s probably too early to be comparing guys to a Heisman trophy-contending defensive tackle, but between Thomas and Daniels, they’re not hurting for love from their new teammates, or chances to play come Saturday for that matter.